Egremont Russet is a lovely russet apple with green skin and firm, sweet flesh with a nutty flavour. The creamy flesh isn't so much juicy as it is moist with a pleasing firm texture. Ideal for use in salads or with cheese, Apple Egremont Russet has proven to be one of the most popular russet apples. 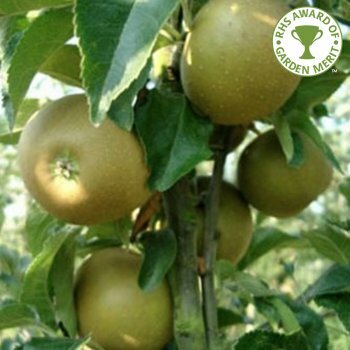 From Sussex in the 19th century, Apple Egremont Russet has good frost tolerance so is ideal for less favourable areas. Expect high yields of golden-green apples in October when a pollination partner is provided in groups A, B or C and situated with a half mile radius. We offer this best selling variety in M27 rootstocks (very dwarf - ideal for growing in pots and tiny gardens) as well as our usual M26 (semi dwarf) and MM106 (semi vigorous). Egremont Russet is a group B apple tree and requires a suitable pollination partner within a half mile radius . An apple tree on a MM106 (semi-vigorous) rootstock will require approx. 4.5 metres between trees, whereas one on a M27 (very dwarf) rootstock will require approx. 1.5 metres between trees. Our pot grown Egremont Russet apple trees can be planted at any time of the year but bare root ones need to be planted between November and March. Remove weeds and grass within a metre of your desired planting hole then dig a hole slightly deeper than your root mass and approximately 3x as wide. To help your tree establish, apply root grow. Gently loosen the roots and place into the planting hole. Using 50% of the original soil and 50% compost, fill in the hole and firm around gently. Make sure not to bank the soil up around the collar of the tree. We recommend planting fruit trees using a stake and tie and a rabbit guard. The Apple Tree Planting, Pruning & Care guide has more detailed information and videos on planting apple trees and using staking kits. If you’re planting in spring or summer, water well and regularly for the first few months. If you’re planting in autumn, you may only need to water your tree a little. Keep an eye on young apple trees and increase watering if there are extended periods of hot or dry weather. Keep the area free of competing weeds and grass for the first couple of growing seasons.